Moscow Lion’s Park, Hordemann’s Pond, East City Park, and other local area parks. Classes now in Pullman. Strolling Like a Mother began its stroller journey in Moscow in May of 2013 with the vision of helping moms work towards their exercise goals, while also helping moms to bond with their children and other local moms. In that, the mission of SLAM is to facilitate friendship, family, and fitness in the Palouse region. Strolling Like a Mother is an hour long stroller workout that includes core work, cardio bursts, and resistance training. Expect a challenging, but fun filled, hour long workout that is individualized to fit your fitness level and needs. At SLAM, you are surrounded by other women who are at the same stage of life. Moms of all fitness levels, both runners and walkers, are welcome. Pregnant women are welcome to join before baby arrives and post-partum moms can begin as soon as they are cleared for exercise by their midwife or doctor. Classes end at parks, where kids can play while moms socialize. During winter months, we have several indoor locations so that moms may still continue their fitness journey together with other moms, while also interacting with their kids in a fun, educational manner. During class, kids are in their strollers and are entertained through counting, song, and education themes. 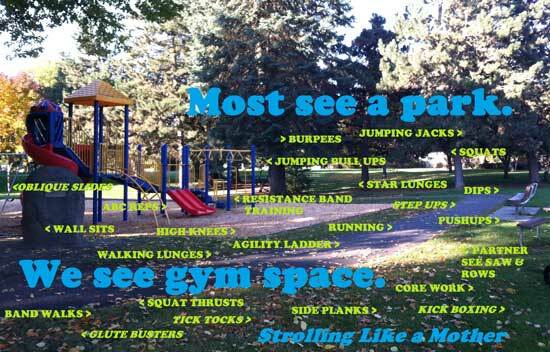 Most importantly, kids that see their kids exercise are more likely to lead an active lifestyle. Above all else, our workouts allow mom to get in shape and model a healthy lifestyle for baby, benefitting the whole family. A healthy, happy mom makes for a healthy, happy family!